At Golden Eagle, we listen and work with you to develop a plan that is best for you, your budget, and your family. 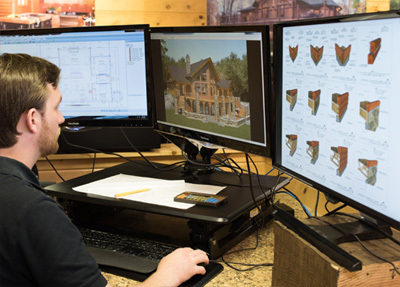 Unlike an architect that might draw one log or timber home in their lifetime, Golden Eagle's team of professional home designers create log and timber style homes every day. Golden Eagle is known for the latest cutting edge home designs, superior energy efficiency, and taking care of everything. Rest assured that when your plans are done, they will meet or exceed your local building codes with no need for you to hire a third-party engineer. We invite you to visit us, but we can accommodate if your schedule doesn't allow the time. We can start the plan process with a combination of e-mail and phone calls. We can also view and collaborate on your floor plans together via web conferencing. 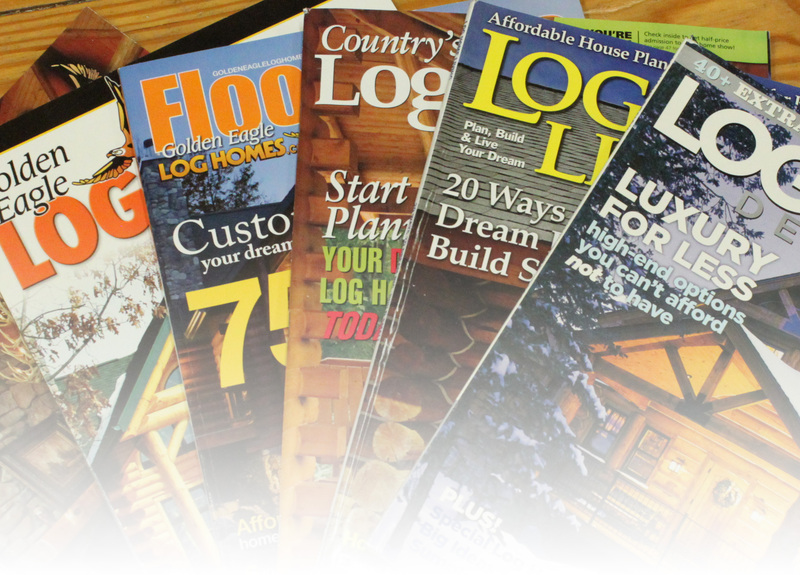 Many of our customers' homes have been featured in national magazines. Golden Eagle Log & Timber Homes not only offers excellent floor plans, but we also provide world-class kitchen and bath design. Our award-winning kitchen design team specializes in custom kitchen, bath, and laundry design. There are so many options in cabinetry that we have a team dedicated to making everything perfect for your kitchen and bath. Cabinetry is not just in the kitchen anymore. Our dedicated design team will work with you on your kitchen, bathroom, laundry room, wine room, walk-in closet, man cave, mud room lockers, etc. Our engineered plans are extremely detailed with every single wall, ceiling, trim size and finish marked on the plan. Your home will be highly customized with your own unique style. Everything is depicted with what you want and creates fewer questions and cost overruns during construction. Our engineered plans include 3D illustrated cross-section drawings and construction details, leaving no guesswork for your builder, subcontractors or building inspector. If there is a question during construction, they can call us six days a week. 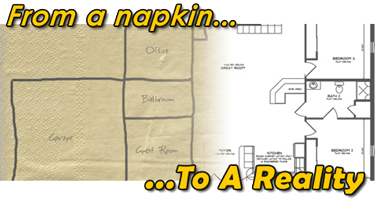 I drew a sketch on the back of a napkin of what I wanted my plan to look like. The people at Golden Eagle helped me design my dream home based off my drawings. They very politely advised me as to what might work better in some areas. My home is almost complete and I could not be happier! Q. How much does it cost to create custom home plans? A. It costs $1.00 per (heated) square foot of home. This means all open porches, decks, unfinished basement areas and attached garages are drawn free-of-charge! Also, when you buy your home package -- you actually receive full credit back for the cost of the plans. In short, provided you purchase your home package, you get your custom plans drawn for free! Q. What should we expect if we go ahead with having our custom study plans drawn? A. You should expect actual plans that are drawn-to-scale. This will include floor plans and all four exterior views (elevations). You may request multiple changes as your plans are evolving. These changes are all done without additional charges. Now that you have detailed and scalable plans, there is nothing holding you back from accurate pricing. You will be able to share the plans with your family and friends so they can share in the excitement of your new log home. A. To begin the process, simply call Golden Eagle Log and Timber Homes or one of our Independent Proprietors. The process of having your study plans drawn is a very enjoyable experience for most people. We will walk you through the process step-by-step.